Soucy Tracks — Preferred Equipment Co.
Soucy is a rubber track manufacturing company that has been in business since 1967. They specialize in the designing and building of track systems for combines, grain carts, sprayers, tractors and more. Their specialization in these products is why Soucy Track has quickly become a world leader in track systems for farm vehicles. With the best ground contact surface on the market, the S-TECH 1000X offers a reduced ground pressure and increases your flotation by 12.5%, compared to previous models. You will be able to harvest when your crop is ready, regardless of ground conditions..
A first of it's kind provided exclusively through Preferred Equipment and ConAg Services, this system is connected to the machine’s mainframe in 3 places on each side and not only transfers the weight of the machine away from the final drives, it redistributes it away from the rear tires, minimizing field damage in wettest conditions. Traditionally, tracks systems simply replace the tires removed from the final drive, leading to possible final drive damage down the road. In this case, the main frame of the tracks system is supported by the pivot shaft, connected to the mount’s beefy main structure. This arrangement completely alienates the final drive components from all of the vertical load bearing and lateral turning stresses that threaten them. We have joined with Soucy to sell their track system and give our customers all the benefits Soucy has to offer. Everyone is always looking to save money, in any way, to profit the bottom line. Based on state-of-the-art-technology, our rubber track system saves you time, and places very little stress on the ground, even in extreme conditions created by muddy or wet soil. If you are interested in this kind of time, money, and field savings that we are offering with our track system, then our track systems are the answer for you. Our four-track system enables tractors to use their full power at any time. Unlike with a two-track tractor, it's never necessary to block or slow down a track to make a turn. The tractor sends all of its power forward, and since it turns as though it were on wheels, the soil remains in better condition through turns. Our track systems for trailers are very versatile and can be used all year round. For example, a track system for a grain cart can also be adapted to your seed drill or planter. That way, you maximize the use of your system and your soil benefits from it in more operations. As vehicles get increasingly heavy, their tires damage your crops in several ways. First, the high pressure they exert on the soil causes compaction, which significantly reduces irrigation quality. Also, their rounded shape often damages crops by creating piles of dirt alongside rows. Unlike wheels, Soucy Track systems, with their vast ground surface area, provide uniform irrigation and protect rows and crops. 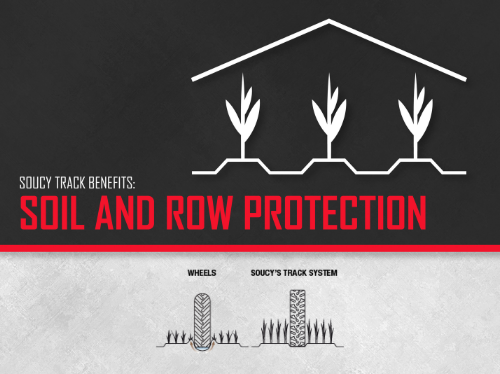 The rubber tracks minimize soil compaction by considerably reducing the pressure that vehicles exert on the ground. The less soil is compacted, the greater its water and air supply, and the better the harvest. This is a significant benefit in the medium and long term. For example, a combine equipped with the most popular wheels will inflict a 25 lb/in2 (1,76 kg/cm2) pressure on the ground. That very same combine equipped with a SoucyTM system reduces that pressure to 5,8 lb/in2 (0,41 kg/cm2). Time is money! Our track systems help you save precious time in most of your operations, which greatly reduces your costs. If you're no longer getting stuck, you can reduce the number of passes needed to prepare your soil for seeding. Furthermore, you'll spend less time in the field because with Soucy Track, you know that you can use your vehicle to its full potential all day long. In short, you will never again be held up by a tractor that has gotten stuck or slowed down by the excessive spinning of your tires. We created our track systems so that it’s always possible to switch from tracks to tires and from tires to tracks. Installing SoucyTM systems requires no modification to your vehicle. That way, it keeps its full integrity and resale value and you can go back to tires at any time. We've developed a rubber track system that allows you to use your utility terrain vehicle (UTV) all year round. Both in snow and mud, you'll discover great new potential in your vehicle, helping you push past the limits imposed by your tires. We know how certain field operations can be critical in maximizing your crop yield. That's why we've designed track systems for farm vehicles that will make sure you can easily access your fields at all times without causing damage to your soil. Therefore, you can spray or harvest at key times without worrying about damaging your soil or crops. Interested in Soucy Tracks? Contact us today and let us help find the right product for your equipment!